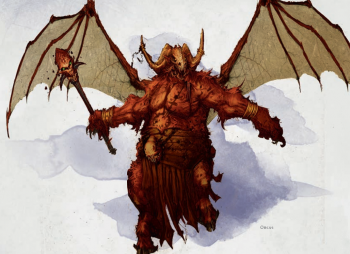 Take an exclusive look at the background features and bonds for the upcoming Dungeons & Dragons adventure, as well as the stats for Orcus, Demon Prince of Undeath. Dungeons & Dragons is very close to releasing its upcoming storyline, Rage of Demons, across its many and varied incarnations. The next month will see the release of Out of the Abyss, the Rage of Demons super adventure book for the 5th edition of the tabletop roleplaying game. 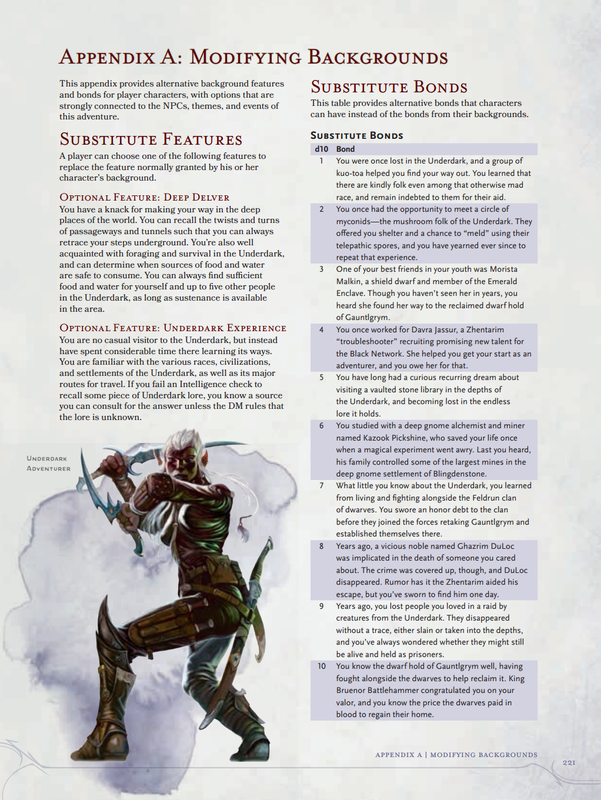 Wizards of the Coast has shared a few pages from that book with The Escapist, and here they are. 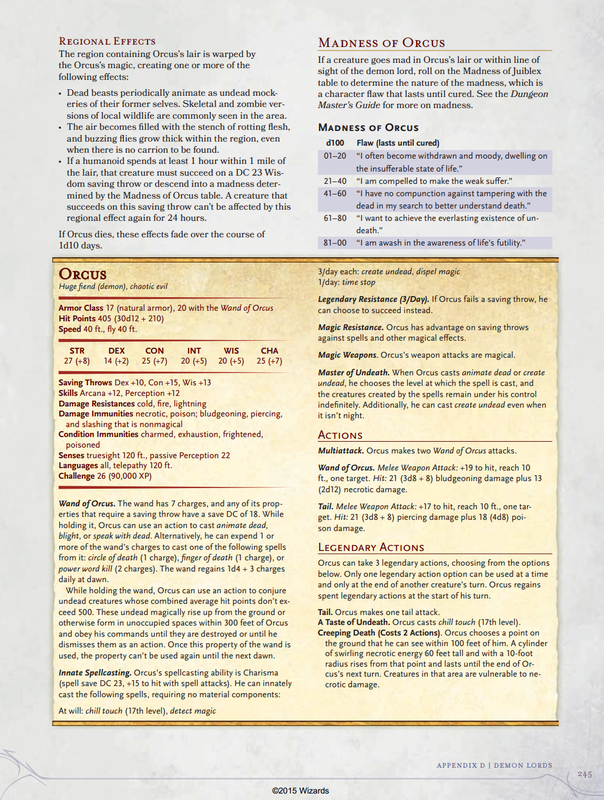 We've got the backgrounds,bonds, and the stats for the Demon Prince of Undeath, Orcus. We'll run through them individually and then you can click below for hi-res versions. First up are the big new character narrative elements introduced with 5th Edition - Backgrounds and Bonds. They have a decided focus on what we can only assume is the beginning of the adventure, but they seem to go in rather varied directions. Since we know the adventure has a sandbox structure, these bonds are likely all seeds leading towards individual locations to be found in the adventure. "The Underdark is a subterranean wonderland, a vast and twisted labyrinth where fear reigns. It is the home of horrific monsters that have never seen the light of day. It is here that the dark elf Gromph Baenre, Archmage of Menzoberranzan, casts a foul spell meant to ignite a magical energy that suffuses the Underdark and tears open portals to the demonic Abyss. What steps through surprises even him, and from that moment on, the insanity that pervades the Underdark escalates and threatens to shake the Forgotten Realms to its foundations. Stop the madness before it consumes you!" A background option that abstracts the problem of supply and survival in the underdark. Apparently not all Kuo-Toa are bad guys. The dwarven kingdom of Gauntlgrym, familiar to readers of the Drizzt novels, seems to play a major role in the story. While other previews have shown Out of the Abyss seems to feature some fantastical and whimsical characters, it's still fundamentally about some of the D&D multiverse's most horrid creatures rampaging about beneath the Forgotten Realms. We know that "Madness" mechanics feature heavily in the module, and that exploration of the underdark will be a big deal. We were able to ask D&D Principle Designer Chris Perkins how the adventure would cater to this kind of exploratory sandbox play. "The characters begin in the Underdark," said Perkins, "but where they go form there is really up to them. [Out of the Abyss] presents many different locations to explore, but the order in which the players visit these locations is really up to them and the DM." Perkins also said that there was a chapter in the book providing guidance to the DM on how to run the campaign, "given its many paths and distractions." Just how big is the threat, though? 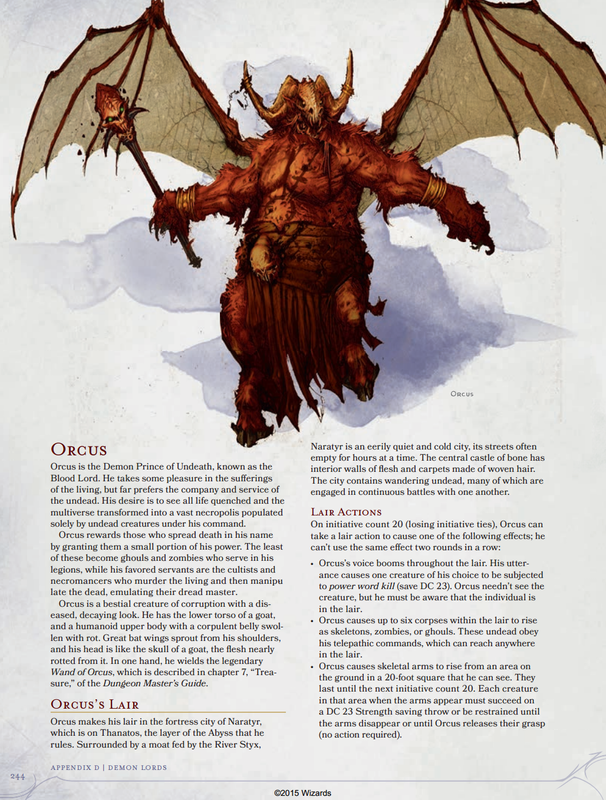 Here's Orcus, which clocking in at Challenge 26 just might be the most powerful monster we've ever seen in D&D's 5th Edition. Of course, we already know that Out of the Abyss has characters topping out at somewhere in the mid-teens of power level. How will the characters deal with these threats? I asked Perkins. I did not get the answer I expected. "It would be madness for the adventurers to take on Orcus in a straight-up fight," he said. "Fortunately, Out of the Abyss gives characters the chance to amass a small army and also turn the demon lords against one another, thus weakening them. There are also a couple other ways to banish the demon lords back to the Abyss, which is the party's ultimate goal." Out of the Abyss releases September 15th. The Rage of Demons storyline is also the basis for the Sword Coast Legends video game which will release late next month.